This catalog was very small with tiny, lawyer-size print. A simple scanning would have left the print too small to read, so enlarged it. The pages are graphics intensive, so the catalog is divided into relevant segments to avoid an excessive download time. 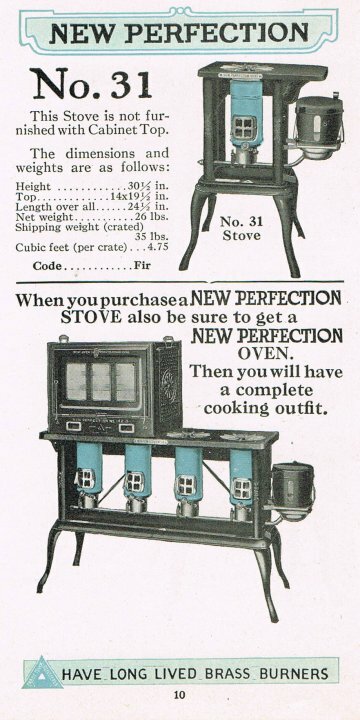 New Perfection #31 Cook Stove, page #10. Cook Stoves #61 and 62 (Ivanhoe), page #11. 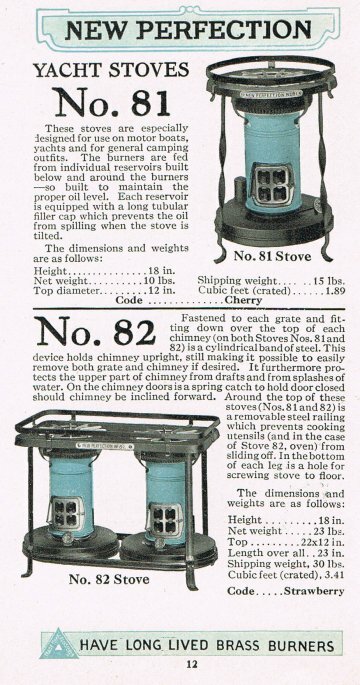 Yacht Stoves #81 and 82, page #12. Cook Stove #37 with heat-retaining oven, page 13. Links to the rest of the catalog. The Long Blue Chimney Burner, page 3. Oil Cook Stoves, Flame Control. Page 5. Brass Burners and Glass Oil Reservoir, page 6. 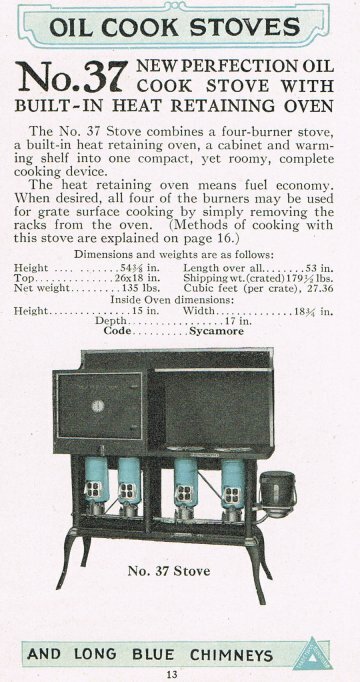 Oil Cook Stove #34, page 7. Oil Cook Stove #33, page 8. 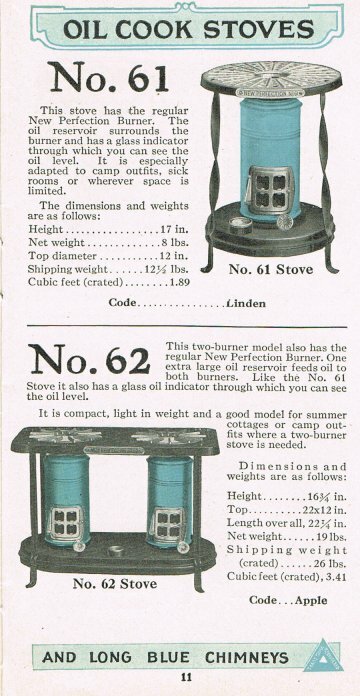 Oil Cook Stove #32, page 9. Methods of Cooking with the #37 Stove, page 16. Perfection Kerosene Water Heaters, page 17. Perfection Triple-burner Hot Water Heater, page 18. Perfection Single Burner Hot Water Heater, page 19. New Perfection Ovens, page 20. Perfection Ovens, one and two burner models, page 21. Perfection Cabinet for Stoves, page 22. Perfection Broiler and Toaster, page 23. Perfection 331X wick, page 24. Alphabetical list by brand name of heaters - and wicks to fit them! List of wicks and the heaters they fit (a cross reference). Measurements needed for an unlisted heater. List of igniters and the heaters they fit. 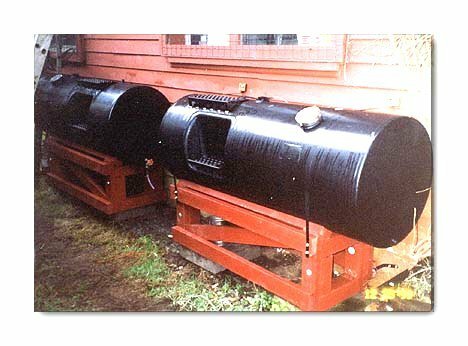 Kerosene Heater Carts - why carry your heater around?